Anna and Elsa in full floral splendor appear in a topiary vignette straight from the hit Disney film “Frozen” at the 22nd Epcot International Flower & Garden Festival. Elsa works her magic to conjure a colorful spring garden in the World Showcase Plaza scene that’s wired to twinkle by night. Copyright Disney (Matt Stroshane, photographer). LAKE BUENA VISTA, Fla. – The 2015 Epcot International Flower & Garden Festival begins on Wednesday, March 4 and will continue through Sunday, May 17. 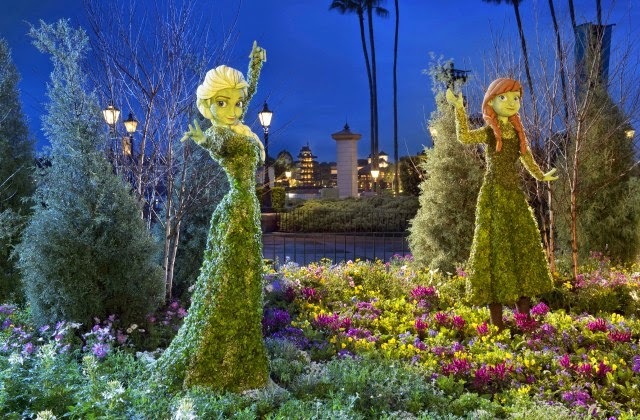 This year, Anna and Elsa topiaries from the animated movie "Frozen" will make their first appearance at the festival. Other new topiaries this year include Disney classic characters Chip and Dale, Goofy, Daisy and Pluto. Last year, the popular princess pair had their character meets moved from the Norway pavilion to the Magic Kingdom while the old Norway 'Maelstrom' ride is converted into a "Frozen" ride that is expected to open in 2016. Although Disney World recently raised its single-day / single-park admission prices, Florida residents can still purchase a 3-day ticket for $139 or a 4-day ticket for $159 which can be used now through June 5, 2015 (with the exception of a blackout week during March 30 through April 9). What else is new this year at the 2015 Epcot International Flower & Garden Festival? Ten new gardens, including a healing-and-health garden, a pepper garden, a dinosaur-plant garden and a Shakespeare garden, among others, that are each designed with a storytelling element. Also, a Southwest desert garden will premiere as a thriving ecosystem. Fresh new menu items will debut at the festival’s 11 Outdoor Kitchens. The new Botanas Botánico Outdoor Kitchen between France and Morocco pavilions will showcase treats like Cachapas with Farmer’s Cheese, a sweet yellow corn pancake, and Seafood Ceviche with shrimp, scallops and grouper with mango and avocado. For the third festival year running, guests can taste garden- and spring-inspired tapas-sized food and beverages, see how the ingredients are grown and have their complimentary Garden Passports stamped as they stroll the World Showcase promenade.